Every type of organisation and every type of building requires a different type of floor space usage, decoration, maintenance, refurbishment, and more. Over nearly the last 30 years, as we have grown, we’ve brought more and more skills in-house meaning that customers can have the security and the simplicity of dealing with one supplier for all their building- and space-related needs. Whichever services you contract us to do, our focus is always on making sure that not only do we carry out the work to your satisfaction but that, right from the planning stages, the work we do for you achieves your organisation’s goals for its staff, visitors, and customers. To talk with us about a bespoke package of services to suit your organisation, please call us on 01753 580 426. As a Framework Contractor to Heathrow Airport and a regular supplier to Gatwick Airport, there are very few companies in the UK that can match the breadth and depth of our service offerings to airport and the quality with which our trained and passionate team deliver them. 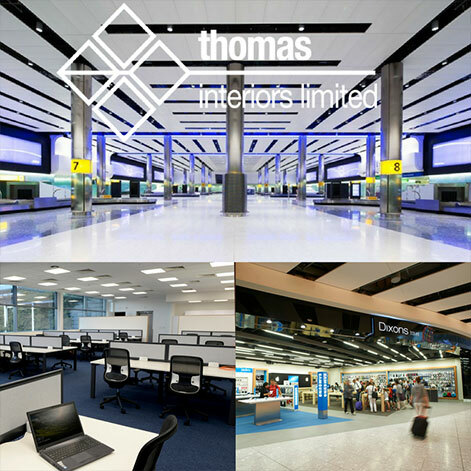 Thomas Interiors has become the company of choice for retailers across many different sectors wanting everything from fit outs and refurbishments to flooring and decorating. Clients include Prada, Dolce and Gabbanna, Watches of Switzerland, World Duty Free, and many more. We offer fit outs, refurbishments, decorating, flooring, space planning, portable appliance testing, ceilings, partitioning and more to our office-based clients. Our emphasis is on a quality finish that improves both your staff morale and your company’s productivity. Healthcare clients really appreciate the volume of interlinked services we provide them with, from plumbing and water treatment and health and safety to refubishments, decorating, flooring, and fire stopping. Trust all of your services with Thomas Interiors by bringing them to us. Given their average size, industrial units require a lot more management, maintenance, and upkeep than other types of commercial premises. We can help you with building maintenance, facilities management, fit-out and refurbishments, commercial flooring, mechanical & electrical services and much more. More and more, competition grows in the leisure and hospitality sector as new players enter the market. Ensure you maintain your competitive advantage with stylish designs, fit-outs, and refurbishments backing it up with leading facilities management and building maintenance. Warehouses require a special type of attention given the value of the goods stored in them. Security is a particular risk as is keeping a clean, healthy, damp-free environment so goods don’t become exposed to risk of damage. Call us to find out how we can help you. Work with Thomas Interiors to bring your learning and residential spaces to life. A better working and educational environment produces higher-grading students and happier staff. Let us know how you want your buildings to work better for you and together, we can come up with a plan to achieve it.